Dubai/Abu Dhabi: His Highness Shaikh Mohamed Bin Zayed Al Nahyan, Crown Prince of Abu Dhabi and Deputy Supreme Commander of the UAE Armed Forces, on Sunday held official talks with Imran Khan, Prime Minister of Pakistan and discussed bilateral relations and ways to boost them. 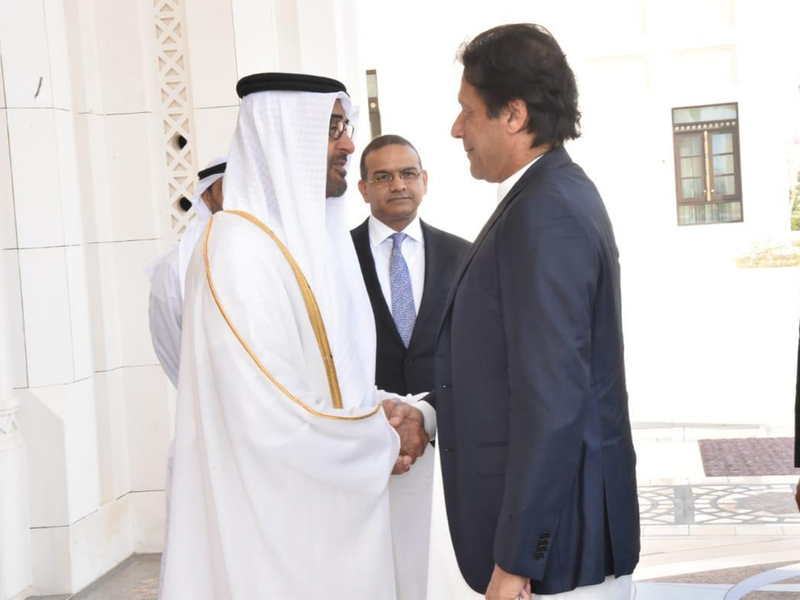 While receiving the Pakistani Prime Minister at the Presidential Palace, Abu Dhabi, Shaikh Mohammad hoped that Khan’s visit to the UAE would boost the friendship and cooperation relations between the UAE and Pakistan. During the meeting, both side discussed areas of cooperation, promising opportunities and various means of supporting and developing them, especially in trade, economic and investment aspects. They also discussed ways of boosting the UAE-Pakistani relations to a wider future horizon of cooperation and joint action to achieve the aspirations of both countries and peoples. They also reviewed regional and international developments as well as a number of issues of mutual concerns. 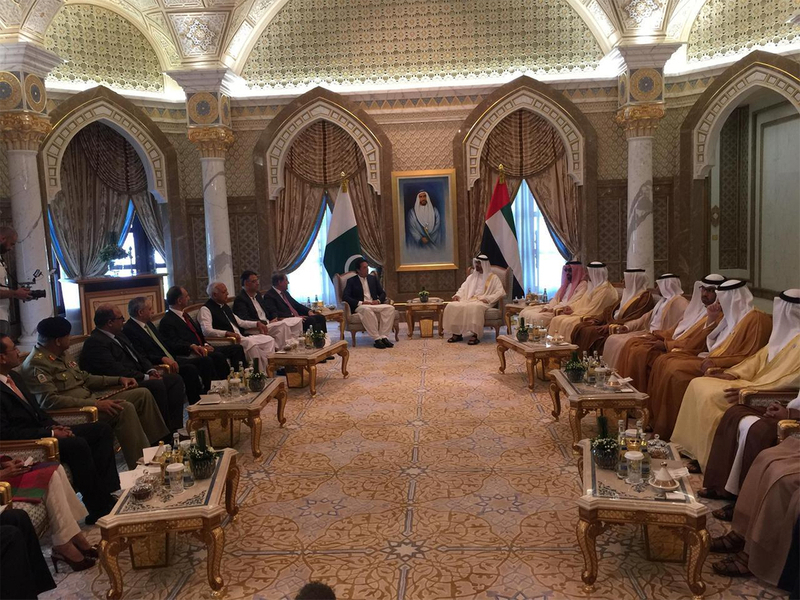 Shaikh Mohammad Bin Zayed stressed that UAE-Pakistani relations are based on a long history of joint work, trust, respect and mutual interests. He expressed his hope to continue developing these relations at all levels and aspects for the benefit of the two countries and peoples. “The UAE, under the leadership of President His Highness Shaikh Khalifa Bin Zayed Al Nahyan is keen to consolidate its relations with friendly countries and expand them on the basis of trust, understanding, mutual respect and common interests to achieve sustainable development, peace and promote the values of coexistence and tolerance on the regional and global levels” Shaikh Mohammad said. 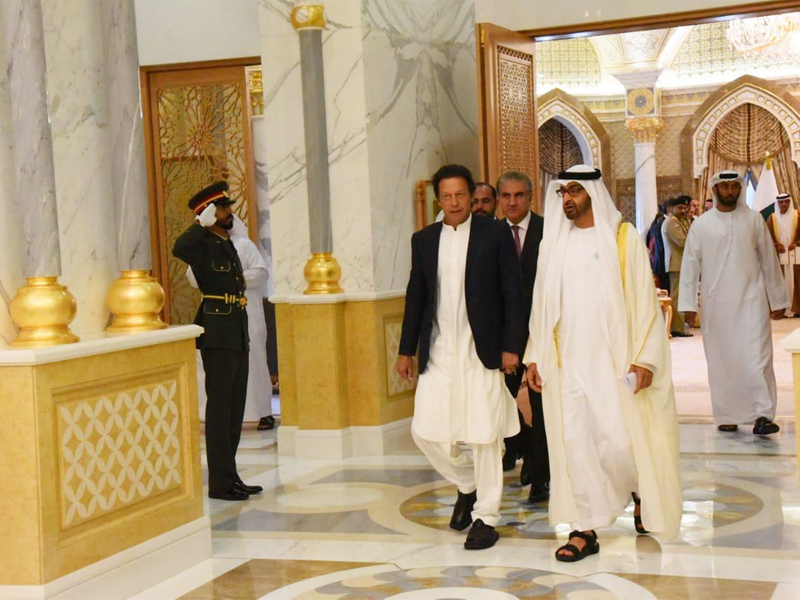 For his part, Prime Minister Khan emphasised his country’s drive to develop and strengthen relations further with the UAE across multiple sectors. 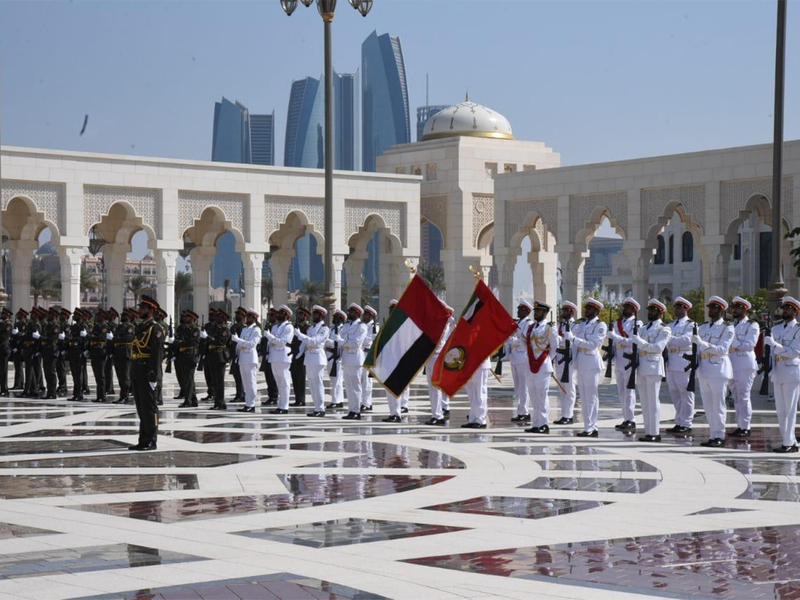 They also stressed their support for all regional and international efforts that contribute to security, peace, stability and development, and consolidating the values of dialogue, tolerance and co-existence of in the region and the world. The meeting also saw the two sides reiterate their support and cooperation efforts to confront the scourge of terrorism and extremism that threatens the security and stability of nations and peoples. Writing in the VIP guest book at the Presidential Palace, Prime Minister Imran Khan expressed thanks and appreciation for the hospitality extended to him and his accompanying delegation during their visit to the UAE, and wished the country further progress and development, as well as prosperity and welfare to its people. On Sunday night, the Pakistani PM also met His Highness Shaikh Mohammad Bin Rashid Al Maktoum, Vice-President and Prime Minister of the UAE and Ruler of Dubai. The Pakistani PM arrived in Abu Dhabi earlier on Sunday on a one-day visit and held meetings with the UAE leaders. He was accorded an official reception where the Pakistani national anthem was played, and a 21-gun salute was fired in his honour. The Pakistan Premier is accompanied by a high-level delegation including Foreign Minister Shah Mahmood Qureshi, Finance Minister Asad Umar, Petroleum Minister Ghulam Sarwar Khan, Minister of Energy and Power Omar Ayub Khan as well as adviser to PM on Commerce Abdul Razak Dawood. Chief of Army Staff (COAS) of Pakistan, General Qamar Javed Bajwa, as well the country’s Ambassador to the UAE, Moazzam Ahmad Khan, were also accompanying Prime Minister Imran. This is Imran's second visit to the country, the first official one being on September 19. Shaikh Tahnoun Bin Zayed Al Nahyan, National Security Adviser; Shaikh Mansour Bin Zayed Al Nahyan, Deputy Prime Minister and Minister of Presidential Affairs; Suhail Bin MohammAd Faraj Faris Al Mazroui, Minister of Energy and Industry; Dr. Sultan Bin Ahmad Al Jaber, Minister of State; Khaldoon Khalifa Al Mubarak, Chairman of Abu Dhabi Executive Affairs Authority, EAA; Ali Bin Hammad Al Shamsi, Deputy Secretary-General of the Supreme National Security Council; Ali Saeed Matar Al Neyadi, Chairman of the Federal Customs Authority; Mohammad Mubarak Al Mazroui, Under-secretary of the Abu Dhabi Crown Prince’s Court; Issa Saif Bin Ablan Al Mazrouei, Deputy Chief of Staff of the Armed Forces, and Hamad Al Zaabi, UAE Ambassador to Pakistan, were present during the meeting. 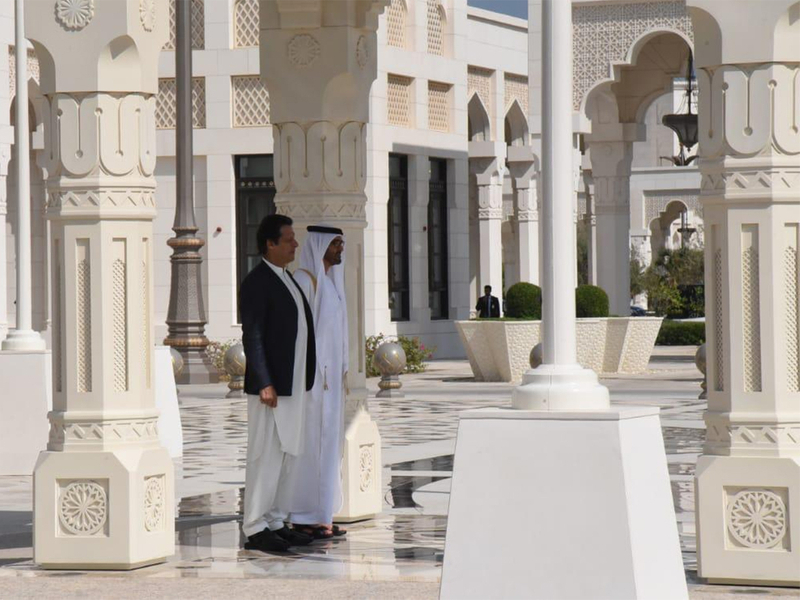 A top official at Pakistan’s Ministry of Information told Gulf News that Premier Imran will be in Abu Dhabi on Sunday to meet the UAE leadership to seek the financial assistance as part of his continuous campaign to salvage his country’s economic situation. The PM and his economic team are expected to hold meetings with the UAE leadership and officials, the Ministry official confirmed. Pakistan’s Foreign Minister, Shah Mahmood Qureshi, has already arrived in the UAE and held a meeting with his UAE counterpart, Shaikh Abdullah Bin Zayed Al Nahyan, on the sidelines of the 9th Sir Bani Yas Forum in Abu Dhabi on Saturday. Details of the agreements between the UAE and Pakistan are likely to be announced on Sunday. Shaikh Abdullah has also visited Pakistan early this month as part of the ongoing talks on economic package with Pakistan, a top official told Gulf News. Foreign Minister Shah Mehmood Qureshi also discussed the "financial package" with the UAE during his ongoing visit, the official said. Pakistan is expecting a financial package from the UAE amid the economic crisis. Last month, Qureshi had said that Pakistan had requested a Saudi Arabia-like deal from the UAE to stabilise the economy. He said Islamabad had urged the friendly country to provide a "fiscal space" to Pakistan amid the economic crises. He said Pakistan wanted to counter International Monetary Fund’s tough conditions through support from the friendly countries. A high-level UAE delegation comprising senior officials of major companies, including Mubadala Petroleum, ADIA (Sovereign Wealth Fund), Etisalat, DP World, Dubai Investment Authority, property developer Emaar, Aldahra Agriculture and Abu Dhabi Fund for Development had met the Foreign Minister in October. The Sunday visit is a follow-up of Prime Minister Imran Khan’s official visit to Abu Dhabi on September 19 and his understanding with His Highness Shaikh Mohammad Bin Zayed Al Nahyan, to forge closer economic, trade and investment relations between the two countries in all areas of common interest. In September, Saudi Arabia had agreed to provide $3 billion for one year as balance of payment support and a further one-year deferred payment facility for oil payments up to $3 billion. Economists calculated the impact of the support at $12 billion. Imran is also scheduled to visit Malaysia on November 20 to discuss economic cooperation with Malaysian PM Mahathir Mohammad. An IMF team is already visiting Pakistan to negotiate the programme, likely to cover a period of three years. The Institute of International Finance (IIF) in its latest report said a potential IMF programme for Pakistan could be valued at $15 billion. The IIF expects an agreement on a three-year IMF programme of $15 billion by end of this year. However, Finance Minister Asad Umar now believes $6-7 billion from the IMF could settle the economic crises.